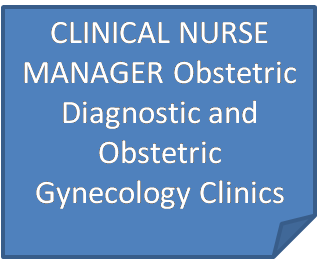 Want to become CLINICAL NURSE MANAGER in Obstetric Diagnostic and Obstetric Gynecology Clinics of one of the most respected health care institution in Middle east, that too in Qatar, under MOH. Please read some details as given in their website. The matter is presenting as it is here to avoid any mistakes and to get good understanding. Service Description: The OBGYN Clinic and OB Diagnostic Clinic will provide patient and family centered obstetrical and gynecologic care in the ambulatory setting for well-women and women with benign gynecologic conditions as well as low risk pregnancies and those pregnant women with complications related to their pregnancy from the pre-pregnancy period through the postpartum period. Additionally, the OB Diagnostic Clinic will provide patient and family centered care to those pregnancies with a high risk of adverse outcomes through services provided by the department of Maternal Fetal Medicine, Diagnostic Imaging, Department of Fetal Surgery, and the Department of Genetics. The Clinical Nurse Manager will report to the Director of Early Intervention Family Centered Ambulatory Care Nursing. The direct reports of the Clinical Nurse Manager will include Clinical Nurse Facilitators, Clinical Nurse Leaders, Clinical Nurses, Patient Care Partners and Unit Clerks. Job Summary: The Clinical Nurse Manager is responsible for leading and demonstrating the provision of safe, patient and family focused quality care on his/her unit/clinic, 24-hours a day. The Clinical Nurse Manager is a key member of the interprofessional team and ensures that standards for nursing care are adhered to at the unit/clinic level. The Clinical Nurse Manager in collaboration with team members is accountable for ensuring that commissioning, recruitment, onboarding, orientation and service activation responsibilities are carried out in accordance with Sidra’s plans, policies, and timelines. The Clinical Nurse Manager is responsible for identifying risks in these processes, informing leadership and actively participating in managing timely solutions. Evaluates and ensures that individualized discharge planning needs are assessed on admission. Ensures safe patient care by making patient assignments based on patient acuity and skill mix. Indentifies patient care issues and/or strategies to improve and positively impact on the quality of care and patient outcomes. Collaborates with the Clinical Nurse Manager and Clinical Educators in planning, implementation and evaluation of patient/family and staff education. Applies problem solving techniques and evidence based solutions to unit/clinic related issues. Evaluates and ensures appropriate escalation of issues to meet patient/family/staff needs and resolve conflicts. Counsels and/or disciplines staff when appropriate. Maintains effective administrative processes in the unit/clinic and reviews and revises unit/clinic policies and procedures as required. Contributes to the achievement of cost efficiency savings in the unit/clinic and maintains an awareness of resource utilization, exercising care in the ordering and use of equipment and materials. Leads Performance Improvement activities and committees on the unit/clinic as assigned. Deputizes for the Clinical Nurse Manager as required. This job description indicates the main key accountabilities of the post and is subject to review and amendment in light of changing circumstances and may include other duties and responsibilities as determined from time to time by the Chief Nursing Officer. CLICK HERE TO READ FULL DETAILS AND APPLY DIRECT THROUGH THE JOB PROVIDER.